The veteran metal outfit entered the studio in January after prepping a series of demos, and now Halford says the group are deep into the project with producer Tom Allom. "Well, we're still tracking,” the rocker tells Planet Rock's Paul Anthony at the launch of Hell Bent For Leather, a new exhibition of leather jackets hand-painted by world-renowned tattoo artists. “I won't say we're at the end, but we feel like we're coming to some of the final moments. And it's just great to watch how a record comes together, from those early, early days where there was just me and Glenn [Tipton] and Richie [Faulkner] sitting in the studio with a couple of guitars and just, you know, doing what we do. You start the day with nothing, and then at the end of day, potentially, you've got a really great, classic Priest song that may live forever. "So we're hard at it,” he adds. “We're still doing what we love to do. Priest is a working band more than anything else. It's that Midlands ethic, the work ethic of anybody that goes to work… I say it's work, 'cause it is work — you're working with your mind, you're being creative. “And now we're moving through into other stages, we're preparing for another big world tour, getting stage designs sorted, lighting designs sorted. So this is the beginning of what's gonna be a very exciting 2018 period." 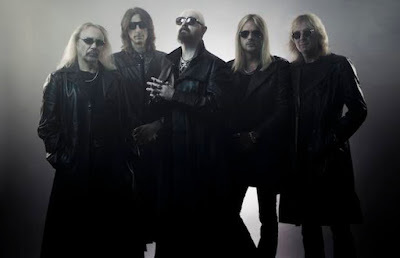 In February, Judas Priest issued an expanded 30th anniversary edition of their 1986 album, “Turbo”, and Halford will release a 14-disc box set this spring detailing his work outside of the legendary UK metal pioneers.